When Barnsley headed into their demanding festive fixture list on the back of successive defeats, there was every chance that they could have endured a Christmas nightmare. The Reds had just been beaten by Sunderland and Wycombe had a run of fixtures against teams who were all challenging at the top. And after drawing with Portsmouth and then beating Blackpool, Peterborough and Charlton, their toughest test awaited on New Year's day at Luton. And they passed it impressively as in registering a 0-0 draw, they held a side who had taken 32 points from 36 available and are one of the form teams in European football. If doubts over the Reds' promotion credentials were lingering ahead of the Christmas period, which has been full of joy, then boss Daniel Stendel reckons their recent results have given them new belief and togetherness in the squad. “I said to the players today, in the last week after the three games we didn’t win and then we came back very well with performances against top teams, I think it’s a new atmosphere in the squad,” the German head coach said. Those targets will undoubtedly be to win promotion and on the evidence of the last few weeks they are more than capable of achieving it. Had they taken some early first-half chances, the best of which fell to Cauley Woodrow, they might have notched an impressive win. Woodrow would have expected to score as he went through, but he grazed the outside of the post. Skipper Adam Davies made a fine save to deny Alan McCormack yet Barnsley ended the first half and started the second strongly. James Shea had to be alert to deny Cauley Woodrow and then Dimitri Cavare as the visitors threatened an opener. In the end, a draw was a fair result and Stendel was content. “The result for both teams was OK,” he added. “In the first half we were the better team and the second half Luton. “We had the better chances but did not score. I am very proud of my team for their performance. Luton: Shea, Stacey, Pearson, Bradley, Justin, McCormack, Mpanzu, Shinnie (LuaLua 87), Lee (Cornick 87 then off injured for Berry 90), Hilton, Collins. Unused subs: Isted, Grant, Jones, Sheehan. 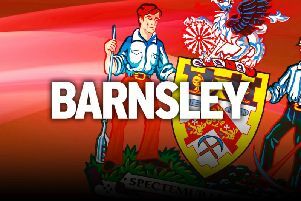 Barnsley: Davies, Dougall (Bahre 63), Pinnock, Lindsay, McGeehan, Cavare, Potts (Adeboyejo 89), Woodrow, Thiam (Brown 73), Mowatt, Williams. Unused subs: Greatorex, Hedges, Moncur, Jackson.